With the new Wilbers 640 shock installed I set off once more for the Carretera Austal. There wasn’t quite the sense of wonder and excitement that I’d felt previously. Partly because I’d lost my riding partner, and partly due to the fact that I’d already covered this ground. I spent the night in Hornopiren again to save rushing to Chaitén. This time I was able to stay at Hospedajde OLY. Which at just 15.000 for a large double room wasn’t bad at all. The first time Sam and I arrived there, we were just told “no” but now, on my own, and well inside the New Year it seemed they were catering to guests again. With the South American summer in full swing I had to wait until the ferry to Caleta Gonzalo was loaded before the conductor would allow my bike on. It was an anxious 30 minutes. Should the ferry be full I’d have had to wait for the late afternoon sailing, which would see me land close to 10pm. Fortunately there was just enough space to squeeze on the newly sprung xCountry, a New York registered KLR 650, and a F800GS. I’d end up seeing plenty of that KLR and it’s American rider over the next few days as we made the journey south. Once I was back on the road I set off as if starting a stage of the Dakar. The new shock was definitely working well. I blew by Chaitén and continued towards Puyuhuapi. I didn’t quite make it as far as the scene of my first breakdown before I called it a day and pulled into a lakeside campsite. The pitches were expensive at $20.000 CLP per pitch, but as they were large I was able to share one with a cyclist. $10.000 CLP was much more respectable and left some cash for beer. Of course the view was fantastic. The next morning I passed the point where the shock failed the first time around. I thought about leaving a cross or some kind of marker, but I didn’t have any materials to work with. I carried on until I found a cool looking bridge that I just had to play on. With that, and stopping for lunch in Puyuhapi, the KLR must have overtaken me, as I found it seemingly abandoned by the side of the road a few miles out of town. As I slowed, its owner appeared from the bushes having decided to take a brief swim. I mentioned that I was going to check out Glacier Colgnate which was just 10 miles down the road. He agreed to tag along. This was as close as we could get after a 3.3km hike. 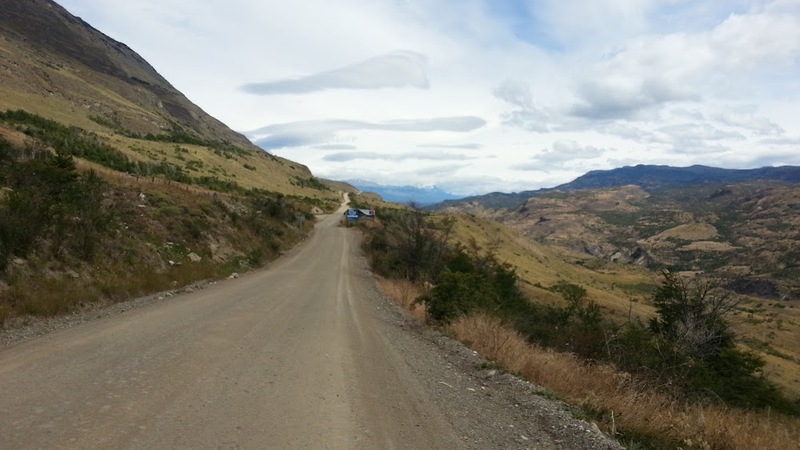 Having read a few ride reports that mentioned Camping Torres Del Simpson, I decided to check it out for myself. It turned out to be a popular spot for overlanders, and an excellent campsite overall. I even got fed by the Ecuadorian wife of a US overlander. At the campsite I also met a German couple travelling on old KTM 640s. Like with the American on the KLR, I’d see these guys a further three or four times on my travels along the Austral and into Argentina. 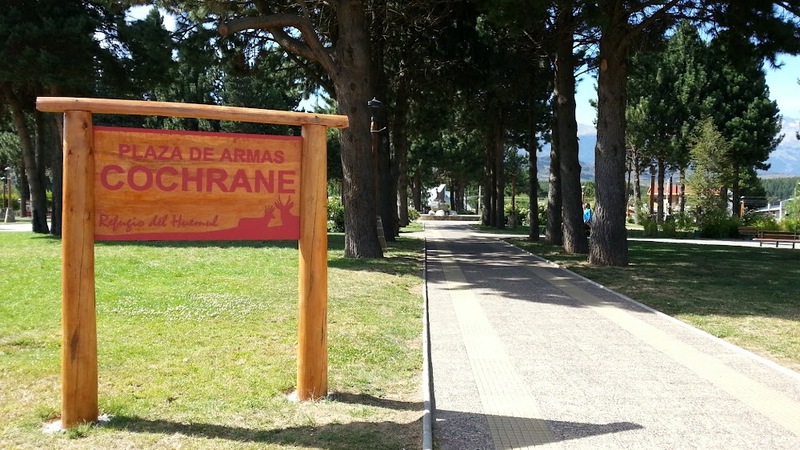 From Camping Torres del Simpson, I headed to Coyhaique which is the only large town on the whole Austral. The route was all tar, as had almost 100 miles of it been the previous day. In town, I got my passport stamped at a local police station since I’d lost my tourist card, and stocked up on supplies. Just south of Coyhaique the road gets closed from 1pm – 5pm for construction. I managed to arrive just as it was re-opening and camped at a quiet little ranch for 6.000 CLP. Just in time, as it started to rain moments after I’d erected my tent. The next morning I set off for Puerto Tranquillo. I was now back on gravel and once I’d passed the 20km of road works it was fast. Easy to hit over 120kph in places. The xCountry wasn’t wanting for power, but I could just imagine how much fun a KTM 950 Super Enduro would be on a few of the sections. Provided you lived to enjoy it. Puerto Tranquillo is a hole. A tourist trap of the worst kind. It has more excursion companies and shops, and a bottle of water will get you back over 2.000 CLP. The only reason I was visiting was to see the marble caves. Despite the plethora of tour companies, but I wanted to kayak there myself. This was a problem as North Face founder and experienced kayaker Douglas Tompkins died a month or so before, so no-one would rent solo kayaks. The water there is a beautiful tourquoise colour, but can be quite dangerous. The strong winds create sea like waves making it a choppy ride. About 7km from the village, I managed to find a place that would rent a kayak to me for the next morning. So I camped at a nearby site. Where I ran into German couple on the KTMs. Like most campsites in along the Austral, this too had great views. The next morning was a busy one. I woke early and headed to the boat rental at Puerto Marmol only to be told that I could not take a kayak out on the lake solo. Fortunately a tour group turned up and she said that I could follow them. I waited and waited, but they were messing about with training and safety instructions for over 40 minutes. In the end I just put my kayak in the water and set off. The ride was super choppy, and I’d saved some money by opting for a sit on kayak instead of a sea kayak. Suffice to say I ended up pretty wet. I could fill the post with images of the caves, but I’ll save that for another time. They were fantastic. It certainly wasn’t easy handling the paddle, and taking photos all whilst on choppy waters, but it was fun! After three hours on the water it was time to head back and pack up my gear. It was already past 12 and I wanted to make it to Cochrane. Fortunately it was easy going, and fast. 20km out of the town, I stopped for a short hike to a point where the Rio baker jumps a river formed by glacial water. I had some fun on these roads along the way, sliding the back into corners and being hamfisted with the throttle. Then I arrived. spending two nights at Hostal Austal Sur. I eneded up with a twin room for just 19.000 per night, with it’s own gas heating and boiler. It was spacious and comfortable. Just what I needed before heading into Argentina via the remote Paso Roballos.